In the commercial and industrial heart of Townsville, right on Woolcock Street, our freight depot is easily accessible for local businesses. Freight can also be collected and delivered to and from your door and can be stored at our yard in the expansive fenced outdoor area. Situated on the Bruce Highway just north of Ayr and is approximately 80 kms south of Townsville. This site comprises the main holding yard for the East Coast operation south to Brisbane, west to Mt Isa and Northern Territory and north to Cairns. 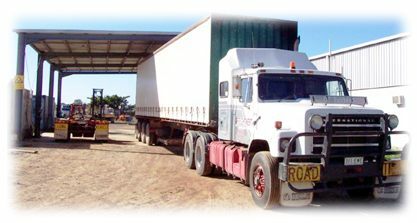 In Acacia Ridge in the busy hub of industrial Brisbane, the depot despatches freight to all areas of Queensland and has secure and extensive warehousing facilities for palletised freight and cartons. Nowhere is too far from Ryan Road and Mt Isa is the receiving and despatching depot in our linehaul “triangle” to and from Brisbane direct and on to the Northern Territory and for freight express from Townsville and the East Coast return. There is extensive outdoor storage facilities. In the heart of the Western Queensland mining belt, the Mt Isa depot handles freight to and from mines and its prime contractors and is trained and experienced in receipt and despatch of mining equipment and materials, such as steel, grinding media, pipe, mesh and specialised vehicles.